When Mark Bruce Company last set foot in Bristol, it was with the hallucinatory and superbly restless Dracula. Having garnered critical acclaim and picked up the prestigious South Bank Sky Arts Award for Dance with that show, it is with great anticipation that the Company’s latest show The Odyssey comes to the city, once again in collaboration with Tobacco Factory Theatres. The Odyssey is, of course, Homer’s epic poem of Odysseus and his struggle to return home to his family after a decade of brutal war and the fall of Troy. The part-sequel to the Iliad, which so inspired Nietzsche with its themes of heroism and valour, sees a reckless God drag Odysseus in an epic journey across oceans to strange lands and the darkness beyond, realms of immortal beauties, shape shifters, monsters and sorcerers. It is a shame that Jonathan Goddard, whose Dracula was so full of menace and stalking broodiness, is unable to play the reckless God in Bristol due to injury. It would have been fantastic to see him play off Chris Tandy as Odysseus. However, having tragically broken his foot during the premiere in Frome last week, the rest of the cast have done fantastically well to restructure their own performances to cover for him. A replacement is set to be found before The Odyssey moves to London at the end of the month. The Odyssey may suffer from having a less familiar and straightforward narrative than Dracula, but what is produced is a series of set pieces, interruptions into Odysseus’ journey. There are terrific stagings of the attack by Scylla, the six-headed sea monster, and the deathly cries of the Sirens. Mostly the atmosphere is a dark one, with an array of strange creatures appearing from the blackness and crawling out from under the bed, but there are tongue in cheek moments as well – although a bizarre arrival of a lecherous one-eyed St Nick as the Cyclops is perhaps a little incongruous. Tandy is superb as the hero, a warrior who carries the decapitated heads of his enemies and sails through seas of blood, nonchalantly smoking a cigarette after copping off with dangerous women, who all the same is troubled by mental demons and pines for home life. Hannah Kidd, as Odysseus’ wife, haunts proceedings like a ghost tugging at the threads of the story, who weeps in torment as a knife lacerates her back for each year Odysseus is gone. Much of the storytelling comes through a series of tableau, but there are some outstanding moments of dance. Wayne Parsons lashes at Odysseus as a tempestuous ocean, while there are excellent solos by Tandy and Jordi Calpe Serrats. A scene wherein Odysseus’ son is tortured could have come straight out of Reservoir Dogs, with Alan Vincent providing the swaggering, playfully masochistic Michael Madsen role. Best of all is the beautifully composed love scene between Odysseus and a young nymph, played by Grace Jabbari. 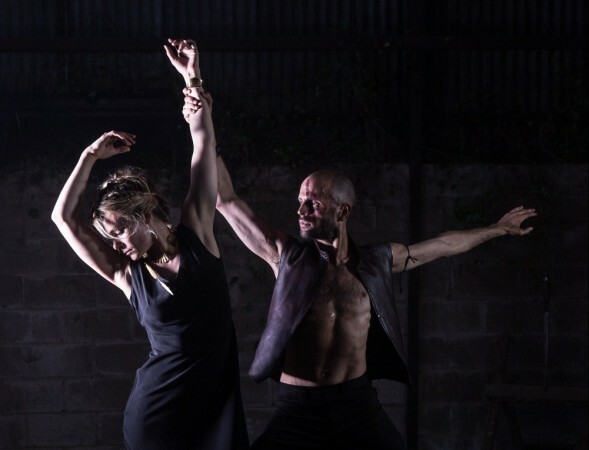 With the Brewery Theatre at the Tobacco Factory no longer usable, this performance at Circomedia is packaged as part of the Theatre’s ‘Beyond’ season. For the next few months, while the second performance space is refurbished and improved, there will be shows across the city in a plethora of spaces, including the new Wardobe Theatre, The Greenbank and The Loco Klub. It is hard to imagine a more appropriate venue for The Odyssey than Circomedia, the high ceilings and religious surroundings offering a sense of grandeur which more traditional theatre spaces would not necessarily provide. Tagged christopher tandy, circomedia, mark bruce, the odyssey, tobacco factory theatres. Bookmark the permalink.